Did the brief flirtation with fitness end when the exercise bike your partner bought as a Christmas or birthday present was tucked away under the stairs right at the back because there was never a chance in hell you were ever going to get on it again?Why this lack of enthusiasm for a more healthy lifestyle? Not surprisingly, many who have ditched the bike cite the fact there is nothing more boring than sitting on a machine, pedalling away but getting nowhere in the process. This is not to say that exercise bikes are not valuable pieces of equipment. Some individuals find them an ideal way to enjoy a workout. However, many people find the temptation to jump out of the saddle too much to bear simply because they lack the self-discipline to persevere. 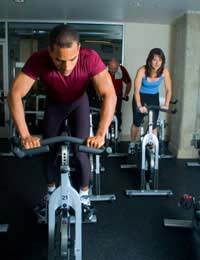 Given that cycling offers a great cardiovascular workout and lower body workout without the higher impact of, say, road running, the solution for many is to choose a Spinning class at the local gym. You will still be static cycling, but this time in a room of like-minded individuals. And if their presence alone isn’t enough to dissuade you from throwing in the towel, there is always the towering figure of the instructor, urging you on, inspiring you to new heights of fitness.Talking of towels, you are going to need one because you could be burning as much as 500 calories during a 40-minute session, and that involves lots of effort that will leave you hot and sweaty. A water bottle is another piece of essential kit because hydration is a key element in ensuring your body is able to perform to its maximum. And that maximum is what you decide. This is not a class populated by highly tuned athletes. It can be a mixed bag of twentysomethings, middle aged housewives or househusbands and senior citizens. The workrate is dictated by the cadence i.e. the amount of times the pedals revolve in a minute, and this cadence or resistance can be set to whichever level suits your current fitness levels. Ok, all sounds marvellous. Apart from the fact, we are still talking about pedalling away without getting anywhere. Yes, that’s true, but there are extra elements that make Spinning so appealing to so many people. The session is structured using music tracks matched to the mood of each section. So when the instructor is visualising a downhill run through the forest, the music will complement this fresh, breezy feel-good factor. Similarly a testing hill climb will require more inspiring sounds. All through the session, you will be able to measure how your body is reacting from the attached heart-rate monitor. As well as the towel and water bottle, it is advisable to invest in a pair of cycling shorts for maximum comfort in the saddle and some hard-soled cycling shoes that will allow your feet to efficiently interact with the pedals. If you are attending your first session, get there in plenty of time so that the instructor can run through the basics and ensure that the bike is adjusted to suit your frame. You never know, you may even be inspired to dig out that old exercise bike so that you can keep up to speed in between Spinning classes. You may indeed be going nowhere fast but you’ll still be destined to arrive fitter and happier.